My Life According to Pinterest: Help your child learn a new language with Little Pim! Help your child learn a new language with Little Pim! My husband's family is Cuban and are all Spanish speakers, so it's an important part of my son's heritage. I would love for him to be bilingual! His Abuelita pretty much only speaks to him in Spanish to help him start learning. I though, unfortunately, don't speak much Spanish. (Those three years spent in high school Spanish class have long since been forgotten.) So, I am always looking for ways to help encourage my son to hear and learn Spanish since I'm not a lot of help. Since he is only 8 1/2 months old he is definitely at the age that is perfect to begin learning another language. 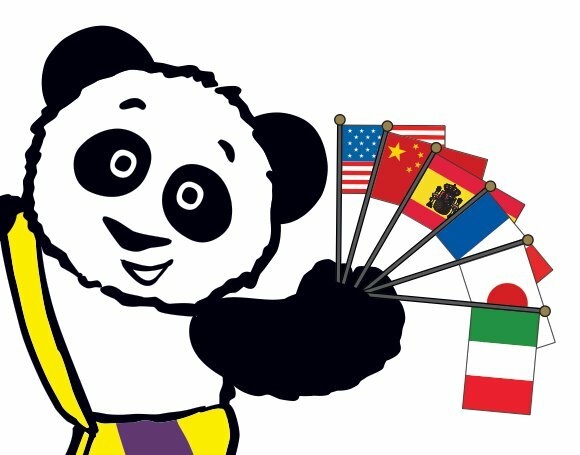 The most current scientific research has shown that babies, toddlers and preschoolers are uniquely equipped to learn one or more languages with ease. 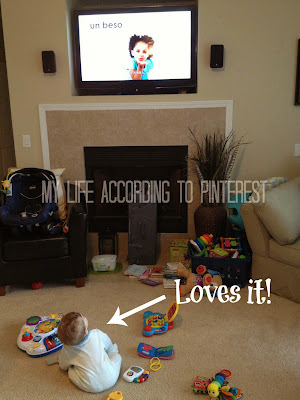 Because of this, I was so stoked at the opportunity to review Little Pim! 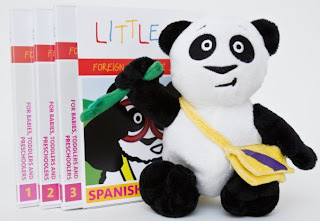 Little Pim provides foreign language education to children ages 0-5. The Little Pim program is available in Spanish, French, Mandarin Chinese, Japanese, Hebrew, Italian, German, Arabic, English (ESL), and Russian. The videos are created so that children can watch either the entire 35 minute DVD or watch five minute episodes, which are helpful for children with brief attention spans. The videos present everyday situations where the foreign language is spoken and the words are printed on the screen in English as well. Only the foreign language is heard on the DVD. There are many products available for each of the languages, including DVDs, iPhone Apps, and phrase cards. Disc 6: I Can Count! Little Pim was originally created in 2008 by Julia Pimsleur Levine. Pimsleur Levine grew up in a bilingual household and understood the benefit. When she wanted to teach French to her son, she was disappointed by the language programs and set out to create her own. Little Pim was created and went on to earn 24 consumer and educational awards! I was given Disc 5, “Happy, Sad, Silly”, from the Spanish series. Baby Boy was able to pay attention for most of the short segment videos. He really seemed to like the video. It shows lots of other babies and kids throughout and I think the real people helped to keep his attention. After the initial introduction to the new words from a segment, they were all repeated again. I think this was really useful as repetition is really key to learning any new thing. In between each smaller segment was a little animation with the Panda, Little Pim, and his friends. Baby Boy seemed to like these too. I was excited because this not only was great for my son, but also for me! Now I can use the new words and phrases I learned when I speak to my son to help reinforce the language skills. Obviously, I don't know if Baby Boy is learning any of the words since he isn't talking yet, but I know that this certainly won't hurt his learning. Follow & Connect: You can Like Little Pim on Facebook or follow them on Twitter or Pinterest. Buy It: You can buy the Little Pim DVD's or Gift Sets at their website. Win It: Stop by tomorrow for a chance to win a DVD in the language of your choice! This is awesome! I think learning a second language, especially when younger is an awesome idea! This seems really neat! I'd love for my kids (and myself) to be able to learn a new language right at home! Awesome. I am bilingual and would love my kids to be as well. I dont really care what other language they speak fluently as long as they do. A video series would be a great introduction to another language. My boys would love these videos! Especially my youngest...I have tried flashcards, but they do not keep his interest. This is very interesting. I'm in the process of creating a curriculum for my toddler (15 months) that include teaching her to read, learning math (dot method) and several other things. It's believed that children are able to learn the most between the ages of 0-5 and sets the foundation for the rest of their life in relation to how they learn and their enjoyment of learning. So I'd love to another language to her curriculum, just haven't found the right program yet. I'll be taking a look and I hope to win the giveaway!!! Take care :)! He also has a few Baby Signing Time DVDs. These are amazing, he gets so excited when they come on and signs along with the show. He is up to about twenty signs and learns new ones all the time! My little one really LOVES tv. I try to make sure that everything he watches is at least educational and commercial free, although I do throw in the occasional Pixar or Dreamworks movie.